Qantas has announced it is investigating direct flights from the east coast of Australia to London and New York by 2022. A direct flight would cut total journey time by up to four hours on Sydney-London and almost three hours on Melbourne-New York. If accomplished, this 20-hour non-stop journey would be longest commercial flight. In order to benefit of strong tailings, the usual Asia and Europe crossing route would probably be replaced by to the one over the Northern pole. “From next year we’ll be flying direct from Perth to London, which is a huge leap forward,” said Qantas CEO Alan Joyce. 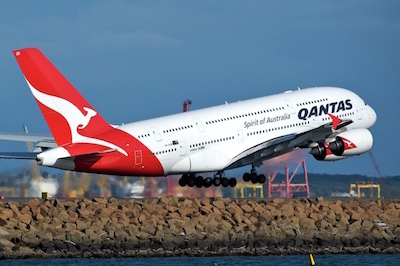 “We believe advances in technology in the next few years will make Sydney to London direct a possibility and Qantas is well placed to be the airline to do it. A challenge has been given to Airbus and Boeing to give their next-generation aircraft currently under development (Airbus’ A350ULR and Boeing’s 777X) the range to make these non-stop flights possible with a full passenger load. “Any aircraft purchase would have to meet strict financial thresholds, but these direct flights would be revolutionary for air travel in Australia,” said Joyce.